The winter weather seems to be back in my area. It has been spitting snow all day, which just makes me want to curl up with a good book and a cup of tea. I love winter weather for about a month, then I get increasing sick of it. I am one of those people that loves when the seasons change and then quickly get tired of the new season. Now there are some seasons that I like more than others, winter being pretty far down the list. One of the things that saves winter for me is the food. I am a huge fan of soups and stews and fall and winter are the perfect time of the year to prepare them. Approximately once a week (at least) during the winter I pull out my slow cooker and try a new stew recipe. I find stew in the winter comforting and makes the cold weather more bearable. 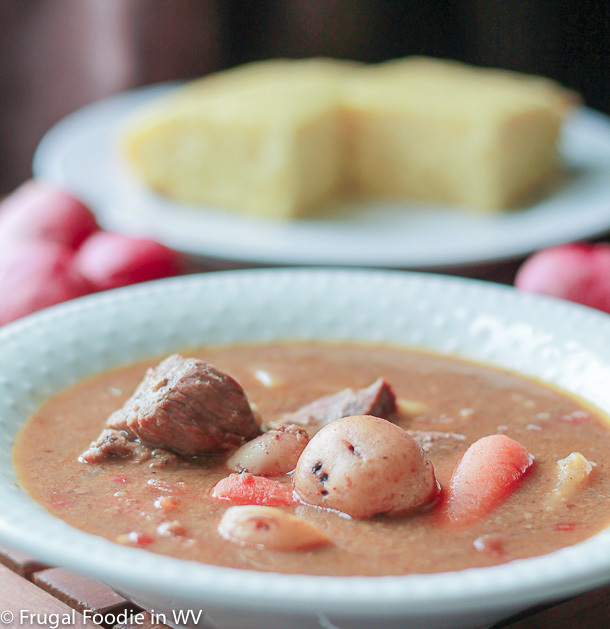 Last week I tried a new recipe for Slow Cooker Beef Stew and Homemade Cornbread from the February 2013 issue of All You magazine. 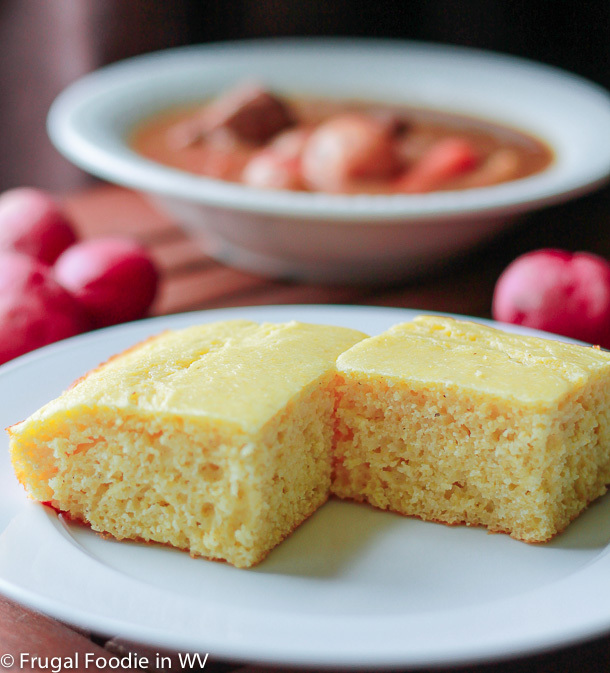 The beef stew recipe has 17 ingredients and the cornbread has 8 ingredients. The cornbread takes a total of 25 minutes, 10 minutes of which is active and makes 9 servings. The beef stew recipe takes a total of 8 1/2 hours, 30 minutes of which is active and makes 6 servings. I did make a few changes to the recipes. For the beef stew instead of all-purpose flour I used brown rice flour. I made my own beef broth from scratch. If you have never made beef broth before it is very easy. Roast 2 onions, 2 carrots and 1 pound of beef bones in the oven at 425 for 40 minutes. When they are done roasting add them to a large stock pot, add 12 peppercorns, 2 bay leaves, 2 sprigs of parsley and cover with water. Bring to boil and then turn down to a low simmer for 4-6 hours. The longer you cook the stock the stronger the flavor. I chose not to top my stew with cilantro since my kids have decided that they currently won't eat it. For the cornbread I only made a few changes. First I used low-fat buttermilk instead of full fat. I try to limit my dairy fats and low-fat buttermilk is a great way to do it. Since I was not eating the cornbread I did not make it gluten-free, but instead made the recipe as written. This beef stew has a little bit of a kick from the chilies and chipotle pepper. I topped my boys servings with a little bit of sour cream to cut down on the spiciness, My husband and I didn't find that the dish was that spicy, but my boys noticed immediately. I like that the beef turned out very tender and the parsnips gave the beef a delicious sweet root vegetable undertone. For the recipes go to Beef Stew and Homemade Cornbread. What an amazing lookin' meal! My family loves beef stew but we've never had it with a kick! Thanks for stopping by my blog, I had to come right over and see about a frugal foodie! Everything looks so yummy! My family loves beef stew too :) Thanks for the sweet comments! YUM! Love anything with a kick! Thanks for the recipe. I love anything with a kick also! I like the sound of spiciness in beef stew! The spiciness gives the beef stew a great flavor, which I love! Aw man, I love cornbread. Especially when it's fresh and warm. What a nice compliment to beef stew, too. I usually make biscuits with my beef stew, but the next time, I think I may go the cornbread route. I make biscuits a lot with my beef stew too, we love biscuits in my house! Hello I found you on a blog hop. I am very excited to follow your blog! Thank you for sharing foodie experiences! Followed you back :) Come back and visit again soon!